[By Nick] For those who don’t know, ice cream isn’t my only love. That second love would be for tattoos. I know it’s a controversial topic and not everyone likes them but I truly have a passion for them. I already have two half sleeves and I’m currently working on adding to my chest. After long deliberation and many, many, many ideas throw away, I finally came up of a way to combine my two loves into one super being. No I’m not talking about tattooing ice cream but instead I decided it was time for me to get an ice cream related tattoo. 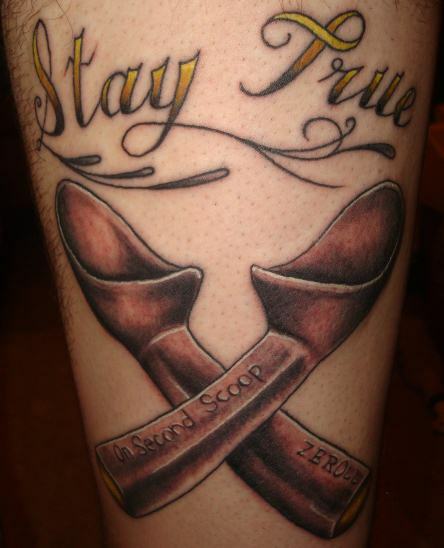 Yes those are two ice cream scoopers in the shape of an X. I’m straight edge as well so I thought what a better way to add even more meaning to the tattoo then by incorporating that in there as well. Stay True is there to remind myself no matter what stay true to who I truly am (an ice cream lover). Also there are inscriptions on each of the scoopers, one being “On Second Scoop” of course and the other being “Zeroll” which is the brand of ice cream scoop that has been used by my family all of my life. Now this isn’t a post to divide people because everyone’s opinion is different but more or less a post just to show another side of myself. Sure I do love ice cream but there is more to me as well. Now here’s a hypothetical question for you readers, if you were to get an ice cream related tattoo, what would it be? If you can’t come up with something that deals with ice cream chime in with whatever tattoo idea you are or would consider getting. Remember everyone has their own option when it comes to things like this so let’s keep this as civil as possible. Dubba's Disclaimer: I'm not a huge fan of doctor's needles, let alone tattoo needles so I in no way coerced or encouraged Nick to do this. He wanted to show his love of ice cream and went with it. Nice ink Nick! Can we see the half sleeves? Congrats Nick I think it's badass! I have a few on my back already (none of them ice cream related) but if I were to get one it would be a simple cone with one scoop of ice cream, maybe done in a simple cartoon line drawing. Thank you, and nice idea. I know I'll be getting at least one more ice cream tattoo but I'm not sure what it'll be yet.